With the launch of the Nintendo Switch just a matter of weeks away, the list of games coming to the system just keeps growing. 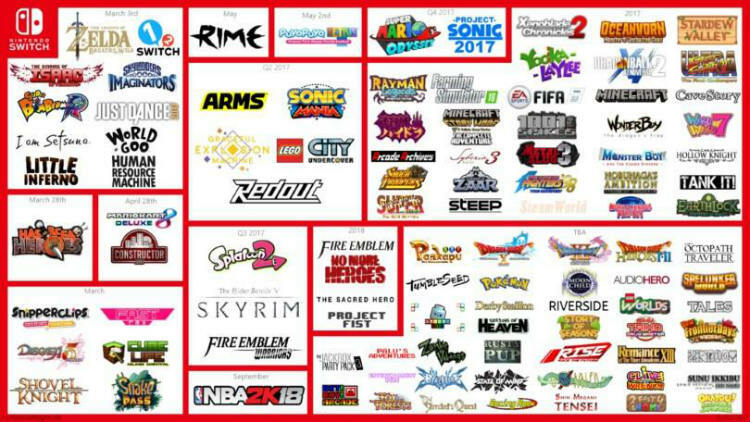 At last months Nintendo Switch reveal, there were a total of 26 games that were confirmed coming to the system. Almost a month later and the list of confirmed games has more than quadrupled. For anyone worried about a lack of games for Nintendo's new hybrid system, those fears should long be gone. Initially there were only five launch games, as you can see from the graphic above there are now 10 titles. Nintendo's Switch Preview Tour came to Toronto January 27th and Jon spent several hours with Nintendo's new system and 15 games. Make sure to check out Jon's article over at World Gaming to see his impressions of the Nintendo Switch. Stay tuned to 4Scarrs Gaming for Nintendo Switch hardware and game reviews in the upcoming weeks. I'll take a look at the Nintendo Switch and its games from a family friendly perspective. In the meantime, watch the extended cut of Nintendo's Switch commercial from the Super Bowl, and let me know in the comments section below what interests you the most about the Nintendo Switch.